The unprecedented executive decision likely ends any chance of reconciliation between the government and the 85-year-old Brotherhood, still Egypt's most organized political group. It marks a stunning reversal of fortunes for the long-outlawed organization that saw member Mohammed Morsi reach Egypt's highest office in the country's first democratic election, only to be ousted in a popularly backed military coup in July. And it takes a step that not even autocrat Hosni Mubarak took in his nearly 30-year rule. Hossam Eissa, deputy prime minister and minister of higher education, read the government's declaration, saying the decision was in response to Tuesday's deadly bombing in the Nile Delta city of Mansoura which killed 16 people and wounded more than 100. It was the deadliest militant bombing since Morsi's ouster and showed growing reach of the country's Islamic insurgency, previously concentrated in the northern Sinai. Although Eissa and the government offered no proof of the Brotherhood's involvement, the accusation instilled in the public mind the image of the group as being behind the surge in violent attacks. 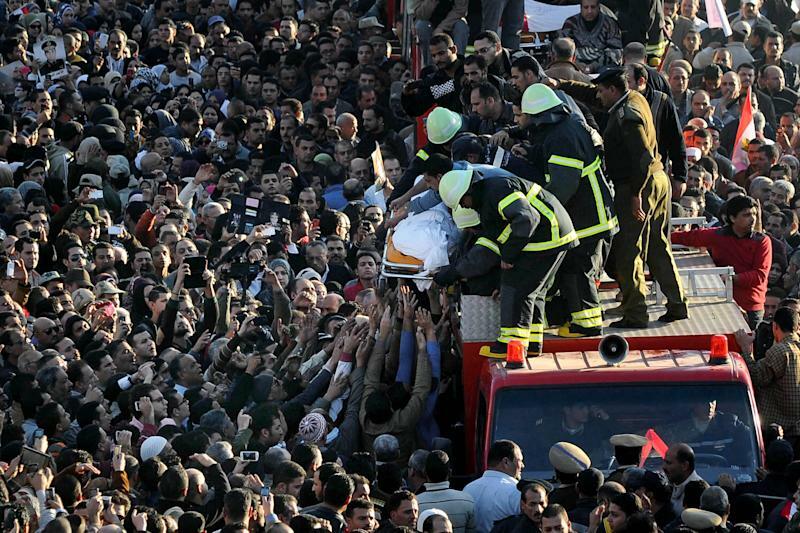 The Brotherhood has denied being responsible for the Mansoura attack. Earlier Wednesday, an al-Qaida-inspired group called Ansar Beit al-Maqdis, or the Champions of Jerusalem, said it was behind the suicide bombing to avenge the "shedding of innocent Muslim blood" at the hands of Egypt's "apostate regime" — a reference to the security forces' crackdown on Islamists following the coup. Brotherhood members dismissed the government label Wednesday, promising their near-daily protests against Morsi's ouster would continue. "The protests are in the streets despite a law restricting them — and killings and prison sentences. All this has not changed the will of the people," said Ibrahim Elsayed, member of the Brotherhood's political group, the Freedom and Justice Party. "The decision has no value for us and is only worth the paper it is written on." Another member, Islam Tawfiq, said the Brotherhood is considering whether to challenge the declaration in courts at home or abroad. "An interim government for nine months will not stymie with terrorism a group working for (nearly) 90 years," Tawfiq said. Soon after the declaration, however, a state-owned print shop stopped printing the Brotherhood party's newspaper. Tawfiq said it followed oral orders from security agencies to halt publication. He also said that the government had notified other Arab countries about its decision. The Brotherhood has organizations and political parties in other nations in the region. A Foreign Ministry spokesman said a regional agreement for combatting terrorism requires Arab countries to hand over those wanted by Egypt. Ahmed el-Borai, the minister of social solidarity, told reporters that the decision means that demonstrations by the group will also be banned. He said that members who abandon their membership and withdraw from the group "will be pardoned." The Brotherhood, founded in 1928, renounced violence in the late 1970s. Since rising to power after Mubarak's ouster, the Brotherhood had faced growing public anger over what critics said was its attempt to monopolize power, enshrine Islamic laws in the country's legislation and allying with some of the country's more radical Islamist groups. The military-backed government has blamed the group for a surge in violence particularly against security forces after Morsi' ouster, accusing it of seeking to destabilize the country to undermine the new authorities and its political plan to hold elections. Security forces already have cranked up the pressure on the Brotherhood since July, arresting thousands of its members, including its top leadership, and cracking down on protests that often have turned violent, leaving hundreds killed. Last week, prosecutors referred Morsi and other top Brotherhood leaders to trial on charges of conspiring with Palestinian group Hamas, Lebanon's Hezbollah, Iran and other militant groups and orchestrating the Sinai insurgency to avenge his ouster. 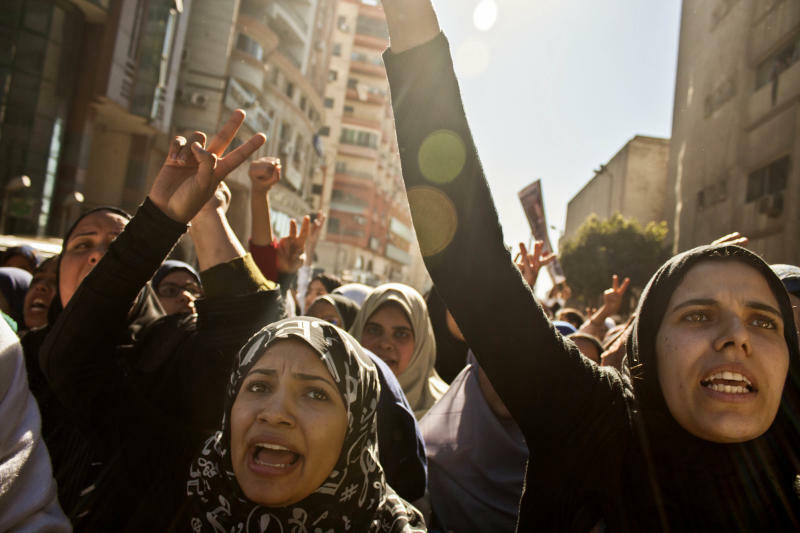 Morsi supporters and rights groups have called the accusations implausible. It's not yet clear what steps the government will take following the declaration. Rifaat Laqoushah, a political analyst, called the declaration "procedural" and could be overturned by the courts. "The government should present strong evidence of the Muslim Brotherhood collaboration in terrorism and present it to courts in order to win a court ruling branding the group as a terrorist one," Laqoushah said. Brotherhood defense lawyer Mohammed el-Damati said he expected the terrorism branding to have no legal repercussions since the group's members are already tried on terrorism-related charges and had assets seized. But el-Damati said the decision will have a psychological impact, increasing the public's hostility against the group. 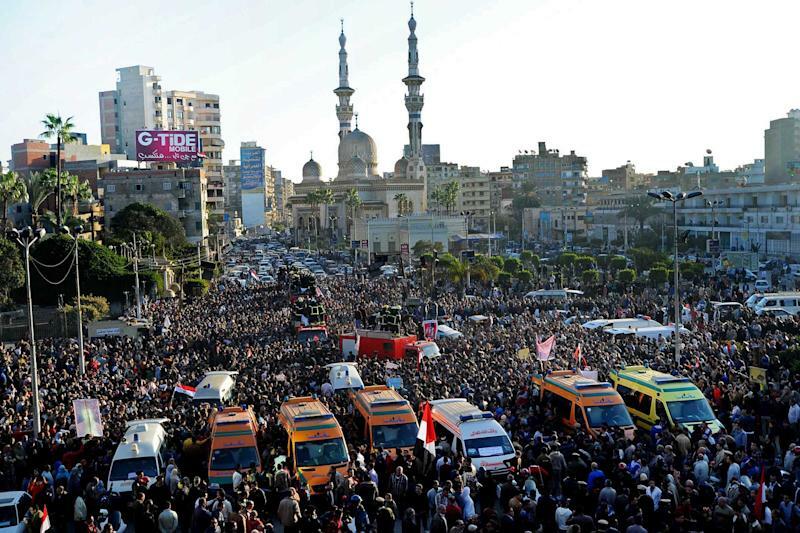 Following the Mansoura attack, many local residents attacked properties of Brotherhood in anger. "These are signs that this is leading to very serious consequences, an introduction to civil strife," he said. Rights lawyer Taher Abu-ElNasr said it is possible that a campaign of coming arrests would be based only on the basis of membership to the Brotherhood. He described it as an "escalating campaign" from both sides. "This is a message that there is no room for negotiations," he said.